Many of us think we know the vehicles that took us to the moon nearly 39 years ago: the mighty Saturn V, the Apollo Command and Service Module, and the Lunar Module. Yet, these marvelous machines did not spring fully formed into the minds of engineers at NASA and its contractors. When President Kennedy set the nation on a course to the Moon in his electrifying speech in 1961, there were a lot of different ideas as to the best way to get there. In his beautifully-illustrated book, The Lunar Exploration Scrapbook: A Pictorial History of Lunar Vehicles, author Robert Godwin takes us back in time from the first serious concept of a lunar landing mission in 1938 through a fascinating tour of more than 200 proposed vehicles. Most of these never made it off the drawing board. Others made it to full-scale mockups and even to functional prototypes. 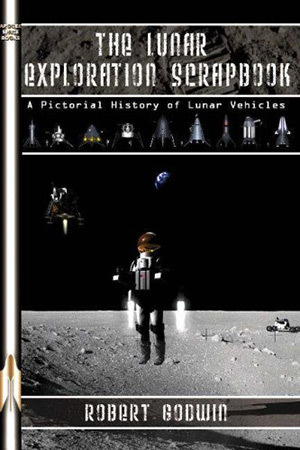 Printed on high-quality glossy paper, The Lunar Exploration Scrapbook contains illustrations and photos of a vast array of lunar vehicles, most of which have not been seen for over 40 years. 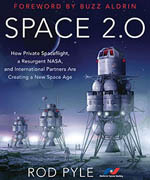 And Godwin’s narrative chronicles the intense competition among NASA suppliers that would ultimately lead to numerous designs—some funded by NASA study contracts and others self-funded by the contractors. We often think of the Saturn V as the largest, most powerful rocket ever built or even conceived. However, in the early stages of the Apollo program, the much more powerful Nova design was the preferred contender for the Moon landing mission. It would have been powerful enough to take off from Earth and fly directly to the Moon, land and then fly back to Earth. The smaller Saturn V was not nearly powerful enough to do that. Instead, the Saturn-based Apollo missions used the lunar orbital rendezvous technique to achieve the mission with a much less massive vehicle. Only the relatively light LM would actually land on the moon. The CSM that had the power to send the crew back to Earth stayed in lunar orbit while the LM made its sortie to the lunar surface. In addition to the Nova alternative to the Saturn family of boosters, designs for command modules ranged from two to six astronauts in capacity, and a similar multiplicity of lunar landers. Habitats were designed to sustain astronauts for anywhere from five to 180 days on the lunar surface. Roving vehicles sported two wheels, four wheels, six wheels, or no wheels. Flying platforms and backpack rockets were suggested. In hindsight, many of these proposed designs seem outlandish or just plain impractical. However, in many cases, they were important steps along the way to the designs that ultimately launched into history. The vision and creativity of the many engineers who developed these marvelous concepts is an inspiration that should guide the efforts of the current generation of design engineers, who even now are designing the lunar vehicles that will take American astronauts back to the Moon. It is a shame that much of the energy, enthusiasm, and creativity that went into the designs of all those Apollo era space vehicles came to an end with the termination of the program. Those drawing board lunar habitats were never occupied. The mobile labs never investigated conditions at a distance from the lander. 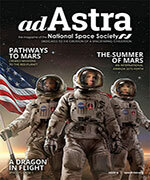 No astronaut ever blasted off the lunar surface with a backpack rocket. Perhaps the dreams of these designers will finally come to pass when we once again set foot on the Moon’s surface. Robert Godwin has done a service in producing this book. He calls the names of many who were instrumental in getting us to the Moon, but who are now all but forgotten. He brings the book to life with beautiful color illustrations and designs that until now have existed only as blueprints. And he reminds us of what might have been—and of what might yet be.